The inside scoop… for when you want more than the official line! Sad. Mad. Scared. Stressed. Distraught. Distracted. Overwhelmed. Divorce dredges up so many emotions and entails so many financial and legal issues, it’s difficult to stay rational and keep your life on track. This savvy, updated guide empowers you to take constructive steps toward a better future. It leads you through preparing for divorce, the process, legal issues, coping, sticky situations, and post-divorce financial and health-care issues. It tells you things attorneys and other advisors may not, and gives unbiased recommendations for negotiating the tricky issues of divorce while keeping your sanity. 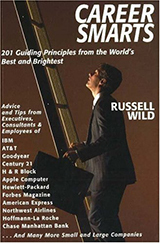 In Career Smarts: 201 Guiding Principles From The World’s Best and Brightest, Russell Wild has compiled a wealth of insights, practical trips, and basic wisdom with a practical value for anyone seeking to achieve success and personal satisfaction through their work. This advice and counsel is drawn from corporation executives, entrepreneurs, leadership trainers, business school faculty, psychologists specializing in work issues, authors and consultants. These experts offer insider perspectives on a series of subjects including leadership, creativity, corporate culture, interviewing, requesting raises and perks, communication, negotiation, job stress, kids and careers, dealing with problematic bosses, working at home, and much more. Career Smarts is practical, entertaining, invaluable reading for anyone entertaining the job market, employers seeking reliable workers, and entrepreneurs wanting to enhance their chances for success in today’s highly competitive world. Bosses and their employees regularly joust as if engaged in a real-life chess match, but supervisors usually hold the edge because they are generally more familiar with the psychological arts of manipulation and intimidation. Journalist Russell Wild’s Games Bosses Play is an attempt to level the game board by providing workers with the ammunition to successfully fight back. 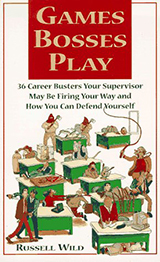 Lighthearted in approach but deadly serious in intent, it parlays interviews with more than 100 experts—from employees to executives to third-party observers—into a revelation of the top 36 exploitative techniques utilized by bosses worldwide and the measures that can be used to counter them. Finally the world has a fitting tribute to uncles, those men who hoisted us up on their shoulders and made fire-truck sounds and who to this day still make us laugh at family gatherings. 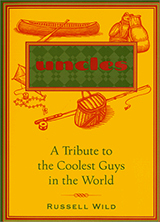 Uncles is filled with anecdotes about these beloved men and their many contributions to family and society. This book is the world’s largest and finest repository of uncle trivia: Find out how Uncle Sam came into being. Learn the location of the ultrasecret headquarters of that international crime-busting organization U.N.C.L.E. Get the scoop on some of the ultimate uncles, both real and imaginary, including Uncle Ben, Uncle Buck, Uncle Fester, Uncle Charley, and Uncle Miltie. Uncles also gives practical advice for men breaking into the role of uncle, including how to dress, what gifts to buy nieces and nephews, and even how to use the uncle status to pick up attractive women. OK, women, calm down. 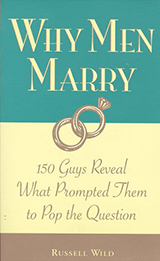 This book won’t tell you how to get him to propose, but it will give you insight into what thoughts, circumstances, and emotions led to the big “Will you marry me?” for 150 other guys. Why Men Marry lets us eavesdrop on men talking about where they met their future mates, what attracted them, how and when they knew that she was “The One,” and why they decided to marry. Don’t expect a clear answer to any of these—their viewpoints about love and marriage are as varied as their voting record or favorite ice cream. 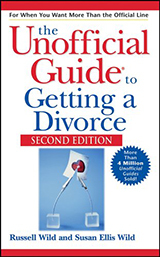 Most of the book consists of short excerpts from interviews, plus one chapter on “The Subconscious Side of Marriage” with insights from experts. Author Russell Wild offers worthwhile commentary, including the useful 12 “revelations and confessions” (why, how, when, and whom men typically decide to marry) and “what every single woman should know.” Wild’s conclusion after compiling all the interview information about why men decide to marry? “Who the hell knows?” and “Why in the world not?” If you don’t mind not getting a conclusive answer, you’ll enjoy the read and the opportunity to listen to men talking frankly.